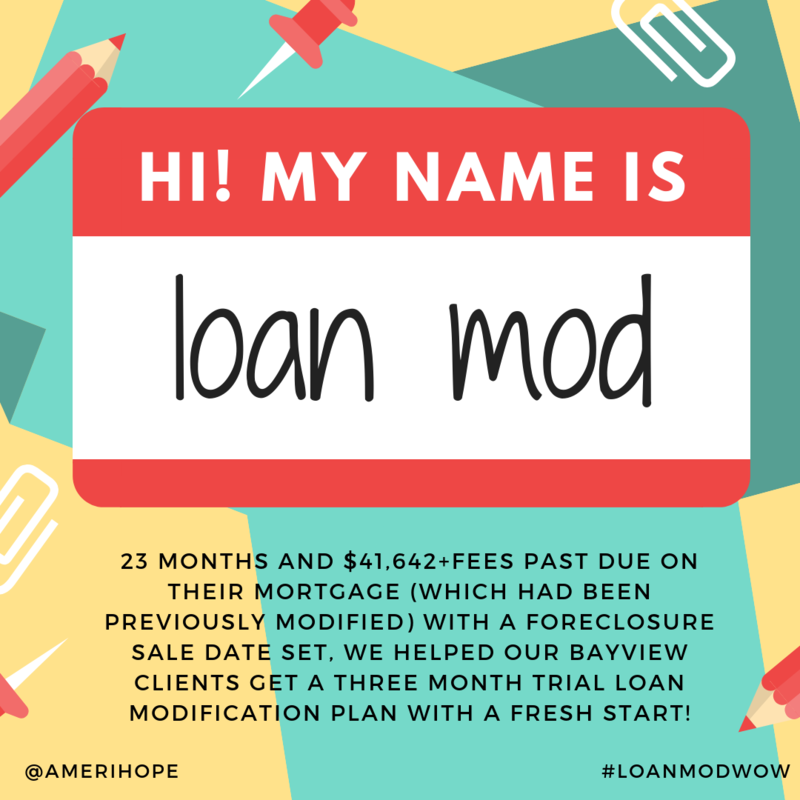 23 months and $41,642+fees past due on their mortgage (which had been previously modified) with a foreclosure sale date set, we helped our Bayview clients get a three month trial loan modification plan with a fresh start! 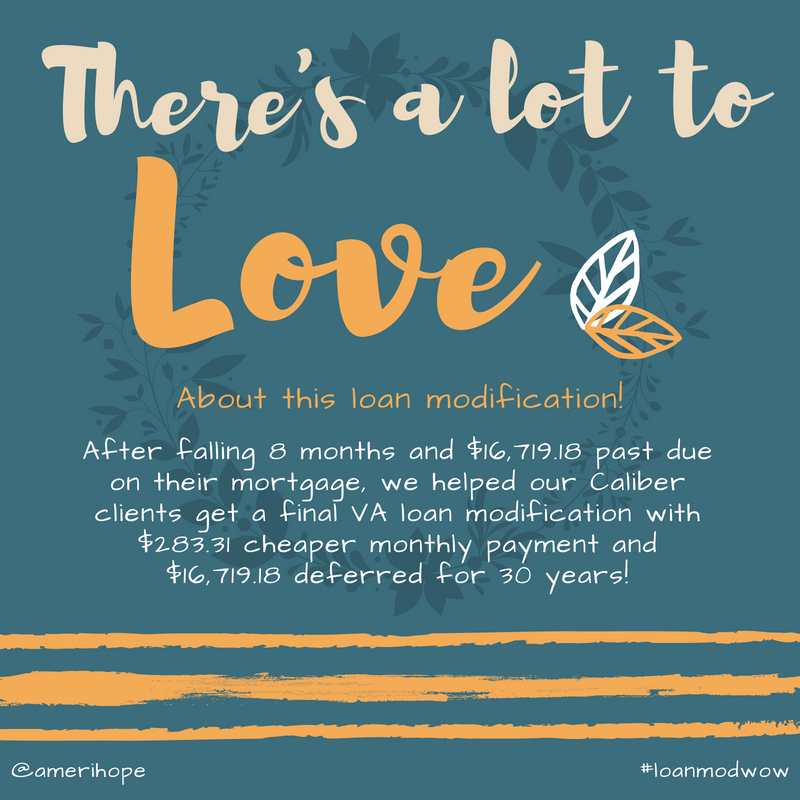 After falling 8 months and $16,719.18 past due on their mortgage, we helped our Caliber clients get a final VA loan modification with $283.31 cheaper monthly payment and $16,719.18 deferred for 30 years! 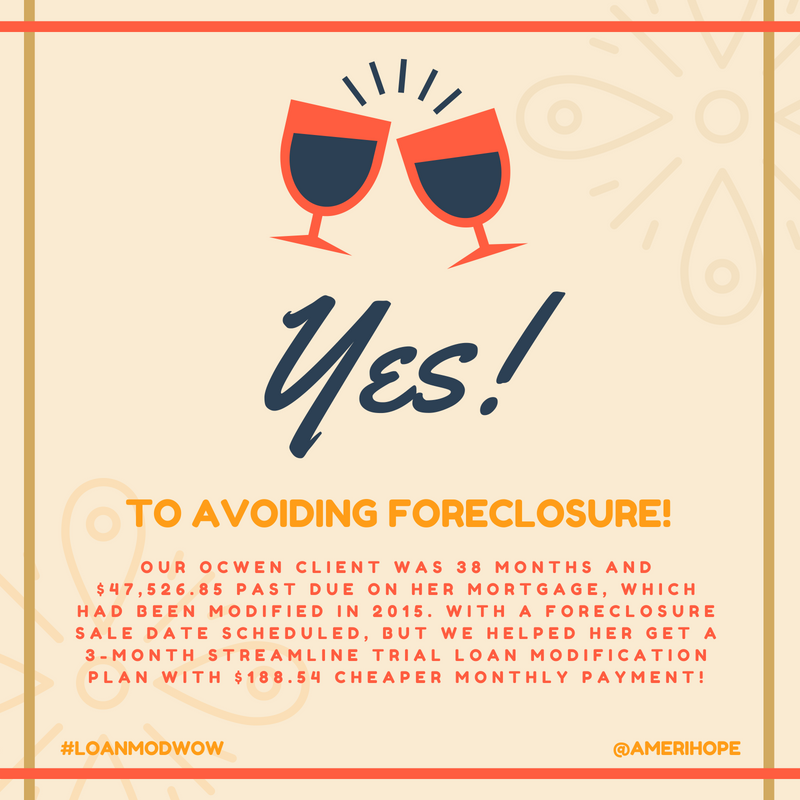 Our Ocwen client was 38 months and $47,526.85 past due on her mortgage, which had been modified in 2015. with a foreclosure sale date scheduled, but we helped her get a 3-month streamline trial loan modification plan with $188.54 cheaper monthly payment! 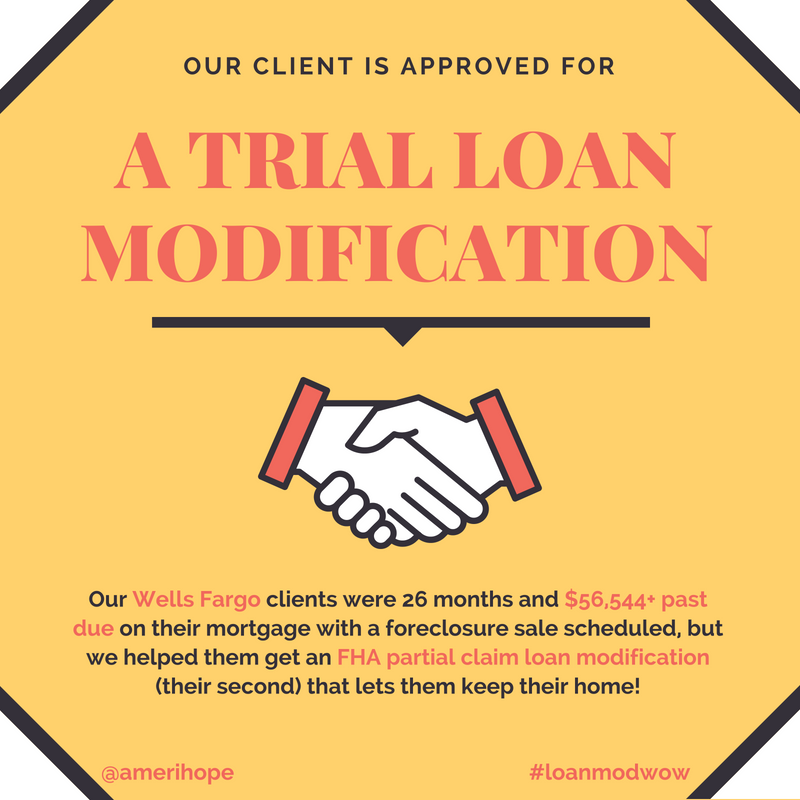 Our Wells Fargo clients were 26 months and $56,544+ past due on their mortgage with a foreclosure sale scheduled, but we helped them get an FHA partial claim loan modification (their second) that lets them keep their home! 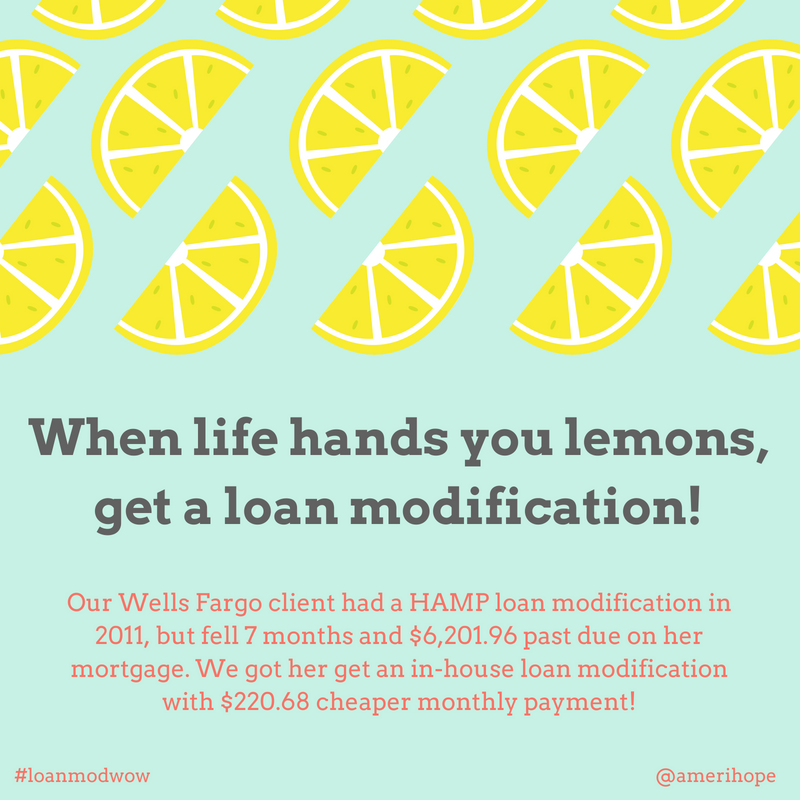 Our Wells Fargo client had a HAMP loan modification in 2011, but fell 7 months and $6,201.96 past due on her mortgage. 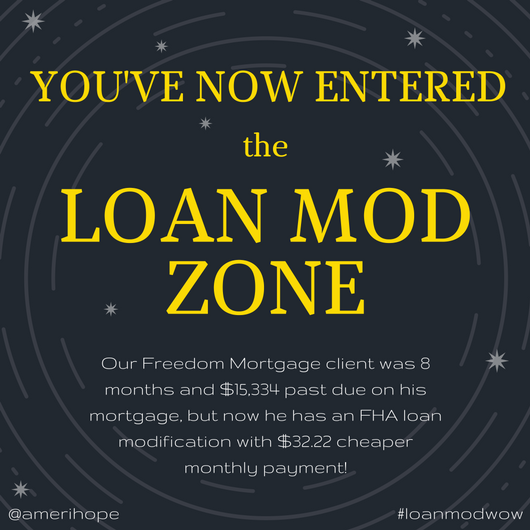 We got her get an in-house loan modification with $220.68 cheaper monthly payment! 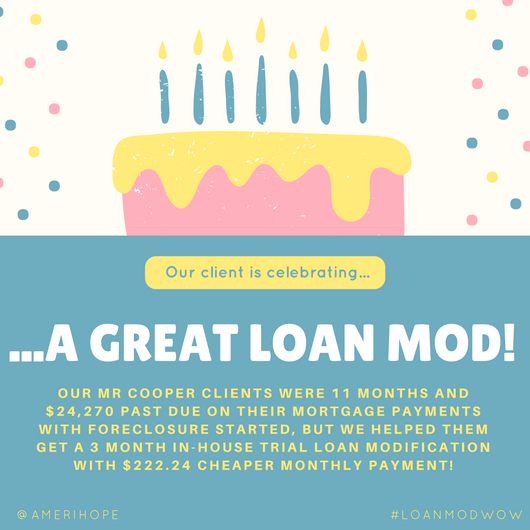 Our Caliber client was 22 months and $54,285+ past due on his mortgage, but we got him a 3 month in-house trial loan modification plan with $336.12 monthly savings! 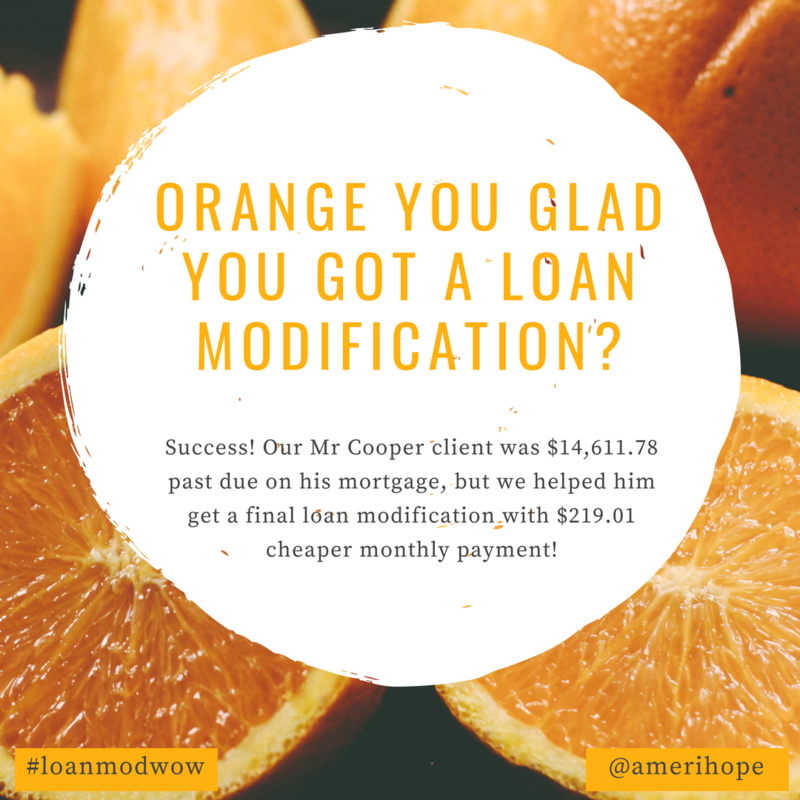 Our SPS client was $72,921.88 past due on his mortgage and had a sale date set, but we helped him get a repayment plan that will allow him to keep his home! Our SPS clients had a May 30th foreclosure sale date scheduled, but we helped them get a repayment plan that stops the foreclosure sale! After the repayment period, they will have the opportunity for a loan modification. 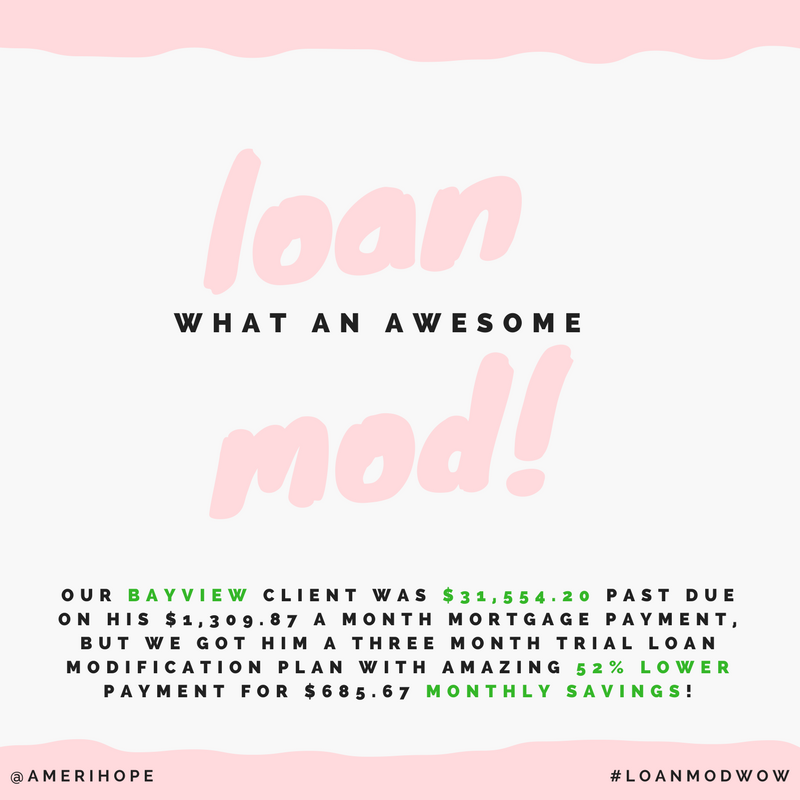 Our Bayview client was $31,554.20 past due on his $1,309.87 a month mortgage payment, but we got him a three month trial loan modification plan with amazing 52% lower payment for $685.67 monthly savings! 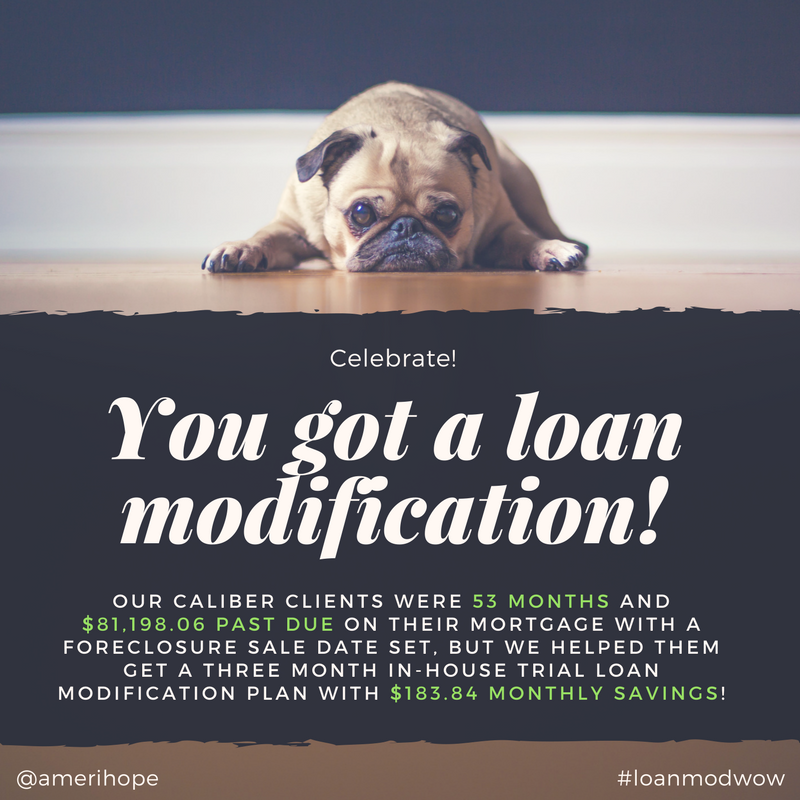 Our Caliber clients were 53 months and $81,198.06 past due on their mortgage with a foreclosure sale date set, but we helped them get a three month in-house trial loan modification plan with $183.84 monthly savings!